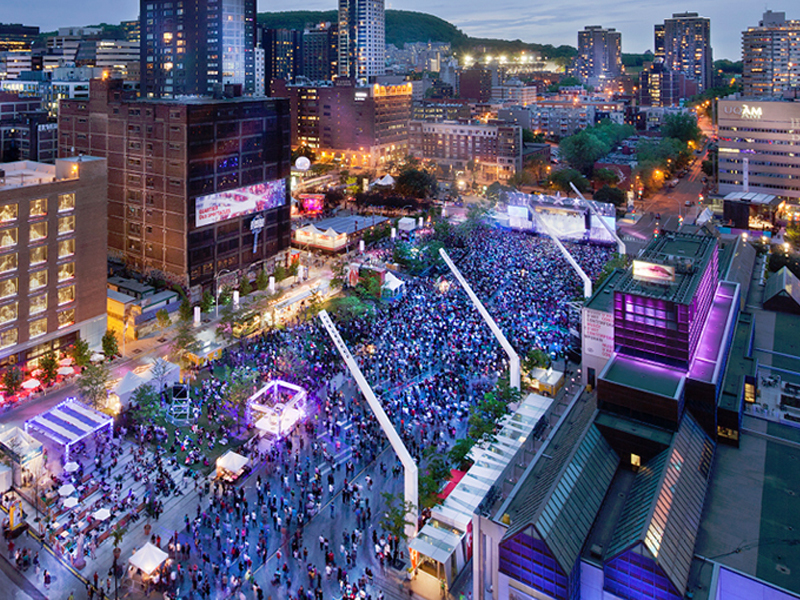 The new Quartier des spectacles at the centre of Montréal offers a potential which the company Realisations.net hopes to help fulfill. The company which conceives, produces and communicates commercial, event-related, museum-based and artistic experiences to touch, amaze and surprise, specializes in the production and projection of living imagery and soundscapes feels inspired by the possibilities the newly implanted art-and-culture dedicated architectural space at the heart of Montréal’s downtown core, and hopes to showcase its world-renowned know-how there, as it does at New York’s Metropolitan Opera where it is responsible for the scene effects in Robert Lepage’s production of Wagner’s cycle, or by making sparks fly under the Montreal Canadiens’ skates on the ice of the Bell Centre during the playoffs. For Realisations.net’s projects concerning the Quartier des spectacles, and even though light shows figure prominently in the desired visual signature of the location, Parent recognizes his company did not internally have the expertise needed to determine « what projecting light shows on buildings entails, » in terms of permissions from building owners, regulation of public displays, as well as various other constraints to ensure the project can go ahead in harmony with all those who live, work and play in that sector, « because all of this represents rather sizable investments in terms of equipment, content production, and so on, » Parent explains. This is the Mitacs Acceleration program’s cue to enter stage right, through the École des Hautes Études Commerciales. “Through our existing relationship with HÉC, we thought they were best positioned to assist us, particularly on the creativity management aspect, which is something we hear about more and more in Montréal, where we are a bit in the vanguard in that field. The Quartier des spectacles’ management agreed completely, and was fully committed,” Mr. Parent said. Through a Mitacs-Accelerate internship, Sylvain Cloutier Fillion, a Master of Management Sciences student at HÉC with a Finance and Economics undergrad background, along with two fellow Masters of Management Sciences students with backgrounds respectively in communications (Myriam Presti) and in urban planning (Alexandre Paradis) , were put to the multidisciplinary task of writing a “bible” to determine how the projected contents would be managed, as well as draft a business plan to ensure the project, while remaining respectful of its surroundings, would be profitable. Through the Mitacs Accelerate internship grant, the interns were also able to enroll in a two-week training workshop in creativity management developed by MOSAIC, a knowledge sharing and exchange platform developed by HÉC’s Professor Laurent Simon, who was the project’s academic supervisor. They studied closely the best practices used in large urban projection projects elsewhere around the world, like in the U.K.,before hatching their final report.